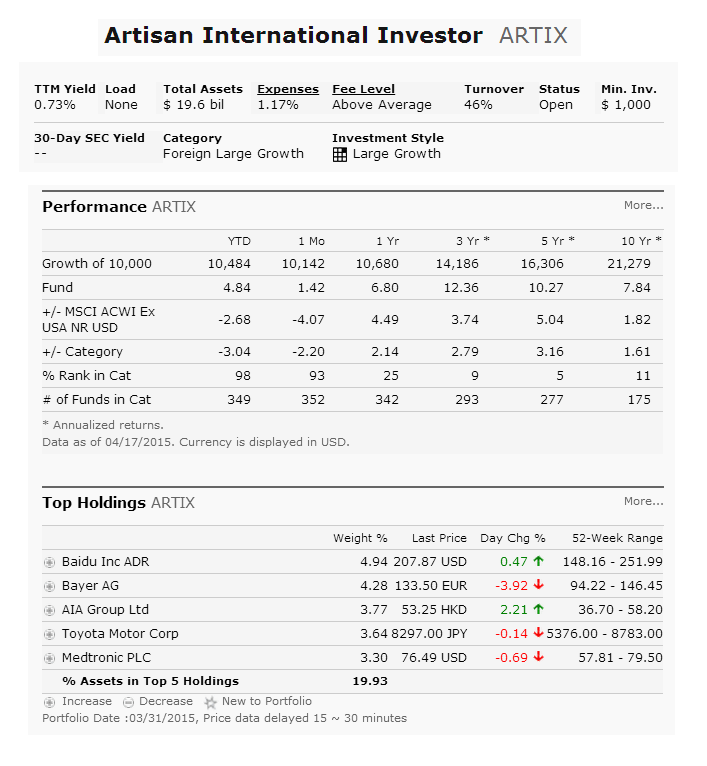 Artisan International Fund (ARTIX) is a popular international stock mutual fund. This equity fund invests in non US stocks located in developed markets. It may invest in emerging and less developed markets. This best fund is managed by Mark L. Yockey, Andrew J. Euretig, and Charles-Henri Hamker. The current dividend yield is 0.73%. The annual expense ratio fee is 1.17%. The portfolio turnover rate is 46%. The current total net assets are $19 billion. Top 5 stocks in its portfolio are Baidu Inc ADR, Bayer AG, AIA Group Ltd, Toyota Motor Corp, and Medtronic PLC. Top 3 sectors are healthcare, consumer cyclical, and technology. Top 3 asset allocation are Non US stock (82%), Other (6.5%), and US stock (6%). The fund performance has been above average. The mutual fund has no sales load. The expense fee is slightly higher than index mutual fund.